Similar to the BMW AG G-POWER, the number one in supercharging, has performed a complex program for the G-POWER M3 supercharger systems to increase its efficiency. The result shows the long-standing experience and the technical expertise of the G-POWER engineering department. Next to the three supercharger systems SK I, SK II and SK II CS for the standard BMW M3, the system for the BMW M3 GTS has now been modified in the course of the G-POWER „Efficiency Program“. Nomen est omen. The “TU” in the name of the G-POWER SK II “Sporty Drive” TU supercharger systems is standing for “technical update” and it indicates that the well-known and proven G-POWER M3 supercharger systems are available with a technical optimized 2013 version. Following the systems for the standard BMW M3’s the system for the BMW M3 GTS has now been updated, too. The revisions have been made in order to enhance the power output, to simplify the system’s installation and are the results of a continuous quality improvement process. The product launch has been preceded by extensive CAD engineering, complemented with virtual computational fluid dynamics analysis (CFD analysis) and intensive test driving. All components of the air intake and the fuel supply system have been developed from scratch or extensively revised based on our many years of experience. The modified air intake is now housing a larger racing air filter that provides for an enlarged air mass flow and at the same time is more durable and dust resistant. The additional air mass, that is provided by the new air intake, allows the use of the ASA T1-523 supercharger compared to the ASA T1-522 supercharger used until now. An additional fuel pump system with ECU for a map controlled activation completes the modification of the hardware. Moreover, thanks to the complete redevelopment of the air intake, its overall part count has been optimized, further simplifying the installation of the M3 “Sporty Drive” TU supercharger system. The modification of the standard ECU software to the new parameters of the forced induction has been completely reworked and optimized in the course of the upgrade process and is now based on the latest software version of BMW. In the end the output is now increased by an additional 15 hp compared to the existing output enhancement. More important to the customer than the naked figures, however, is the power delivery – i.e. the experience generated by the additional output. The key here is the term “Sporty Drive”. In the specification for every tuning program undertaken by G-POWER, this aspect is afforded the same priority as the target power increase itself. The very first thing you notice behind the wheel of a BMW M3 GTS with a G-POWER “Sporty Drive” TU supercharger system is the extremely sporty throttle response. Every input from the gas pedal is translated immediately into forward propulsion, without the lag usually associated even with modern turbocharged engines. The driver’s command is proportionally and instantaneously implemented. One further characteristic of mechanical supercharging using the ASA radial supercharger is the outstanding torque in the middle of the rev range, which is particularly impressive during overtaking manoeuvres. This lively response from mid-range revs increases continuously until engine speed peaks, which is also where maximum boost pressure is achieved. The acceleration experience is akin to being fired from a catapult. In sheer numbers: the standard sprints from 0-100 km/h and 0-200 km/h are completed in 4.1s and 11.8s. Even more impressive: from 100 km/h to 200 km/h it takes the G-POWER M3 GTS 2.2s less than the standard M3 GTS. Top speed is 323 km/h. Of course the negative acceleration is in the focus of G-POWER, as well. The G-POWER braking system with six respectively four brake pistons bytes into mighty up to 396 mm in diameter Ceramic-Carbon brake discs. The high performance braking system for the G-POWER M3 GTS has been exclusively designed together with Mov’it according to the specifications of G-POWER in order to match the performance and top speed of the G-POWER M3 GTS. With this set-up, the G-POWER braking system always provides maximum brake force and the braking point remains precise in any case. In addition the G-POWER ceramic braking system reduces the unsprung mass by 50% percent, compared to a system with steel brake discs. Accordingly the cornering and road handling is improved significantly. In order to ensure that this extra power is delivered safely to the road, G-POWER recommends a combination of the G-POWER 20-inch SILVERSTONE CS wheel set with Michelin tyres measuring 255/30 ZR 20 on the front and 295/25 ZR 20 on the rear axle. 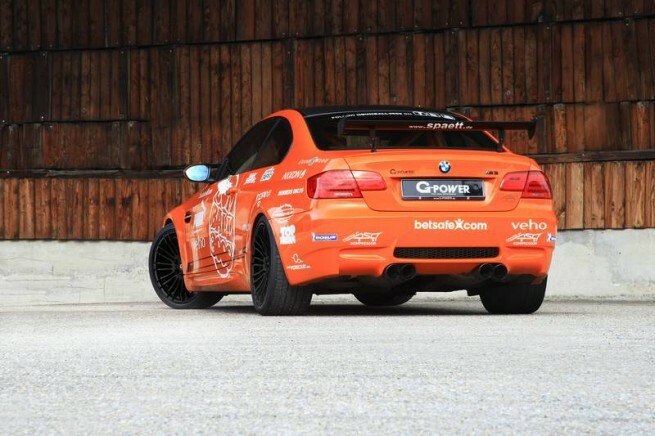 Further modifications to the series-production suspension of the BMW M3 GTS were not undertaken, as the standard M-GmbH setup already guarantees perfect balance and race-ready handling. It was only the shortage of power that was preventing faster lap times. With 650 hp, the hunt for lap time records is now on.